Ann Arbor Huron senior wing Xavier Cochran had an impressive junior campaign, averaging 17 points, and five rebounds per game for his River Rats. Combined with his dominance on the AAU circuit with the Michigan Mustangs, Cochran currently holds seven reported scholarships offers, Eastern Michigan, Rice, Oakland, Northeastern, Buffalo, Kent State, Dayton, and Buffalo. Still, the 6’5″ southpaw swingman is enjoying the process and allowing every school to deliver their own individual messages. Xavier has a specific set of criteria which will influence his college decision when he is ready. “Style of play, how they develop players, relationship with the coach,” Cochran chimed in. For now, Xavier shifts his attention to Huron’s upcoming campaign. Cochran headlines a trio of talented senior guards in Jalen Thompson and Dave Wren. The River Rats return four starters from a season ago, and will start the season as a top 15 team in Michigan. Expectations will be high at Huron this year, with the ultimate goal of capturing a Class A state title. “Going into my last season, I’m expecting a state championship,” Cochran noted. High school basketball competition begins in Michigan on Monday, December 8th, the same day as the Derrick Coleman Midwest Tip-off Classic. 2014-2015 will be the second year of the Tip-off Classic’s existence. It’s founder, Derrick Coleman, was raised in Detroit. He attended Northern High School, and eventually went onto star at Syracuse University before becoming the number one overall pick in the 1990 NBA draft by the New Jersey Nets. This year’s Classic is a two day event. Day one features four teams venturing in from Chicago, Harlan Academy, Marshall Metro, Bogan Academy, and Morgan Park, winners of two straight Illinois 3-A state titles. Detroit King, Western International, Romulus, and University of Detroit Jesuit, in order, will combat the visitors from the windy city for Michigan. In last year’s event, Chicago teams went a combined 3-1 vs. Detroit competition, Orr bettering Southeastern, Bogan topping Frederick Douglass, and Morgan Park outlasting Pershing. Only Mumford seized victory over Hyde Park. Day two spotlights various local programs across Metro Detroit. Detroit CMA vs. Edison, Cass Tech vs. Chandler Park, Henry Ford vs. Loyola, and Mumord vs. Highland Park Renaissance Academy. In addition to a premier boys event, December 6th and 7th feature a multitude of girls games. As teams from Flint, Toledo, Saginaw, Detroit, Romulus, Wayne, Oak Park, River Rouge, Chicago, and Grosse Pointe set the stage for another highly anticipated winter of high school hoops. Basketball season is back, and the NBA tips-off first. Michigan has had a long tradition of producing pros, and this season in the association, for at least opening day, there are eleven players who are from Michigan, or played in the state as an amateur on a team’s roster. From Grand Rapids, stretching all the way across to Detroit, Saginaw, and every town in between, here are the players representing the mitten for 2014-2015. Detroit Consortium junior Luster Johnson stood breathless at the Breslin Center last March. His Consortium Cougars had just captured the Class C state championship. Although the Cougars will enter the new season eager to defend their hardware, the task became increasingly difficult compared to last season over the Summer. Gone from a year ago is Josh Jackson, the consenus number one national recruit in the country’s 2016 class. Jackson decided to finish his remaining two years of eligibility at Prolific Prep in California. The 6’7″ swing-man averaged 28 points, 15 rebounds, and six assists per game for Consortium. Along with having played alongside Jackson during the school year, Johnson also had the opportunity to play travel basketball on Josh’s AAU team, Under Armour 1Nation. Despite the two playing in separate age groups, Johnson was able to challenge himself in the 16u division against quality competition and better his game on a weekly basis. A 6’2″ scoring combo guard, Johnson said he improved his perimeter shooting over the off-season, developing various ways to attack the basket, and becoming an impact defender, while adding collegiate interest from U of D Mercy, Florida A&M, and Youngstown State. Luster notes he learned the high school game after another successful Consortium guard, Travon Baker, an All-State graduate of 2012, who accepted a scholarship to Northern Illinois to further his basketball career. The base of the Consortium program is built around family. When Coach Al Anderson tragically passed away in the winter of 2013, it only brought the Cougar community closer. Last year’s team embodied the term family, two-three seniors routinely started every game and while others played their own unique individuals roles in path to winning the championship. This upcoming campaign is significant on many levels. First, Consortium moves from Class C to Class B, and second, only two returning starter come back from last season. Luster acknowledges Jackson at times during the year made it easier on his teammates to succeed, but Consortium was a collective unit. According to Johnson, the absence of Josh only gives Consortium added drive to outwork their opponents just a little bit more. Johnson undoubtedly enters his junior year as the leader of the team, as he averaged 12 points, and four assists and steals each game last year, even earning his way into the starting lineup for a majority of the season. Luster, or Pookie as he is referred to, still believes his team can reach their championship aspirations this upcoming season. He wants to lead by example this year, he stated he got into the off-season condition program more this Summer than he had in years past, and developed a higher IQ for the game. But still something else fuels Luster’s drive to achieve. When Consortium won the crown, Luster said he was the first to do something big in his family. This season, however, Luster and his Consortium Cougars will take a different path to success, one of perseverance, confidence, and most importantly, a sense of togetherness. “Everyone plays a role in the CCP (Consortium) roster,” Lusted said. “It will be a challenge, we just have to come together as team, we are just waiting our turn to have a chance to prove ourselves. 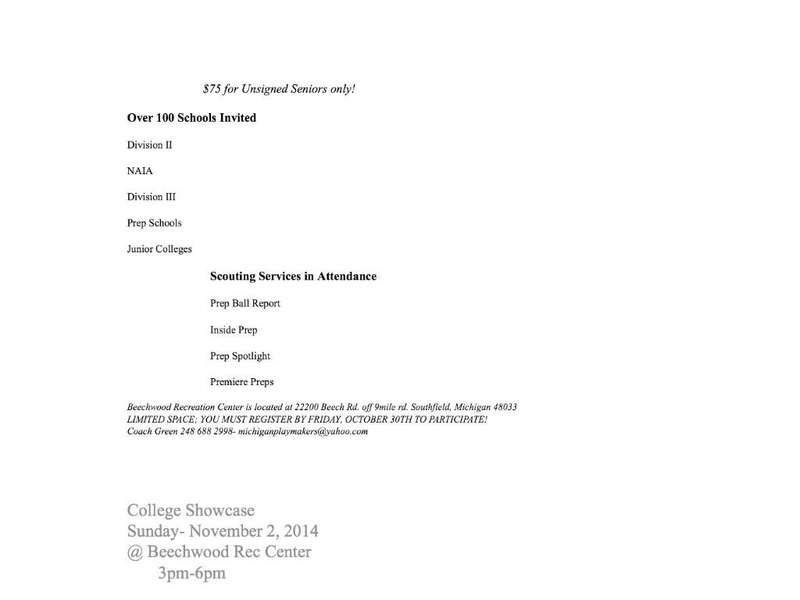 Unsigned senior showcases get off to a quick start this year, with the 2014 Michigan Playmakers College Showcase. On Sunday November 2nd, coaches from division III, NAIA, prep schools, and junior colleges will be in attendance at Beechwood Recreation Center in Southfield, Michigan from 3-6 PM. The Michigan Playmakers are a travel club basketball team located in the greater Metro-Detroit area. With teams from middle school through high school, the Playmakers competed in various tournaments across the the midwest this past Spring and Summer. Participants in the showcase will be be instructed through various drills, and compete in team scrimmages. Space is limited, and participants must be registered by October 30th. Beechwood Recreation is located on 22200 Beech Rd, off of 9 mile Rd. Kris Clyburn, a 2014 graduate of Romulus High School, has only been on the campus of Notre Dame Prep in Fitchburg, Massachusetts for a little more than two months. However, through open gyms, scrimmages, and workouts, Clyburn has accumulated two division one offers, one from Buffalo, the other from Fairfied. The Buffalo scholarship offer is unique to Clyburn. Bulls assistant coach Nate Oats was Clyburn’s head coach at Romulus for Kris’ sophomore and junior seasons. Kris had multiple collegiate offers in high school, but when he decided to attend a prep school for a year, many went off the table. Notre Dame prep has a reputation as one of the premier post-graduate basketball programs across the country, with distinguished NBA caliber alumni such as Michael Beasley and Ryan Gomes. Given the prestige of the school, Clyburn has worked endlessly this fall to improve on his individual game. He notes he has been increasing in strength, improving upon his ball handling, and becoming craftier around the rim to go along with his strength of perimeter shooting. All of which will aid in Clyburn fulfilling his goals for the upcoming campaign. “My goals are to win a championship,” said Clyburn, “and I plan on pulling in more division one offers. In Michigan’s class of 2013, more than twenty players committed to division one schools. With just one year of college on their resume, a few have appealed to become very promising NBA prospects in the future. According to NBADraft.net, three members of the class of 2013 are ranked top 50 sophomores for the national class of 2017. Rhode Island’s EC Matthews, Iowa State’s Monte Morris, and Michigan’s Derek Walton. The highest was EC Matthews at number 7, a 6’5″ 190 pound combo guard. In his freshman season, EC averaged 14 points, and four rebounds a game for the Rams while playing more than 30 minutes each contest. Matthews guided Romulus High School to the 2013 Class A state as a senior. Coming in at 30, was Michigan’s Derrick Walton Jr. Walton started 36 of the 37 games for the Wolverines his freshman campaign, averaging 7.9 points a game, and three rebounds and assists as well. Walton attended Chandler Park Academy for high school and played under his dad. A four year varsity participant, Walton received the Michigan Gatorade National Player of the year award his senior season, where he averaged 26 points, seven points and steals a contest. Number 45 on the list is Monte Morris. Morris played in all 36 games for the Big 12 champions Iowa State, starting the last 17 contests. Morris averaged seven points, three rebounds a game his freshman season, and broke the record with 4.79 assist to turnover ratio. Morris came to Iowa State after a successful prep career at Flint Beecher, capturing two consecutive Class C titles his junior and senior campaigns, culminating with the state’s Mr. Basketball Award his senior season. The second annual Owens Community College Jamboree is one of the premier exposure opportunities in the midwest for JUCO talent. Teams from Michigan, Ohio, Illinois, and Pennsylvania were all in attendance, and made for a great day of college hoops. Crews set the tempo all day long for Jackson. He is a unique combination of size, speed, and athleticism at the guard position. Crews can run the show when needed, with a strong handle, court vision, passing ability and quickness to attack the lane and find teammates. However, he can score as well, finishing around the basket, and hit a few mid-range and three pointers on the day. Tre’Vion was also very active on the defensive end, he anticipated passes well leading to easy scoring opportunities for Jackson on the break, and also applied good on-ball pressure on opponents. It was a tough day for Schoolcraft, going 1-2 on the day, which is expected of a team only being together for roughly a few months. However, the Ocelots showed flashes at times of a promising future. The man who caught the attention of all the collegiate coaches in attendance was Oak Park 2014 graduate Ja’Christian Biles. At 6’1″ Biles is an electric above the rim finisher who brought down several high-flying dunks on the day. A high-volume perimeter scorer, Biles will pair nicely with 6’2″ sophomore guard Lorenzo Collier, Collier hit a few threes on the day, and should develop into a solid scorer as the season progresses. Up front for Schoolcraft, 6’8″ forward Anthony Wartley-Fritz was a pleasant surprise. Big Wart looked more comfortable and in control with his back to the basket on the low block, with improved footwork for the 2014 Taylor Truman Cougar. He’s isn’t going to jump out of the gym, but the athleticism of the team up front will be left up to 6’8″ +s Kaion Seales and James Pruitt, the three are still building rebounding and defensively chemistry, but will be tough to handle the day they figure it out. The host school did not disappoint with three solid performances on the day. At times, Owens looked like they could challenge a quality D2 program at the very least. 5’7″ sophomore point guard Shaakir Lindsay is hard to find on the court, he’s a pass first point guard combined with a speedy handle that can spot teammates in drive and dish situations. 6’4″ wing guard John Murray complements Lindsay as a reliable go to scorer with playmaking ability on the perimeter. His length, and size make Murray a potentially promising 1-on-1 defender. Down low for Owens, the Express have 6’7″ forward Kenny Jones. Jones is stuck in the proverbial “tweener” category. Regardless, few at the Jamboree produced better than Jones in the paint. Kenny was able to rebound against taller and stronger opponents, challenge shots, run the floor and push the ball up the court like the guard, and throw down some wicked dunks. Jones was tracked by a multitude of coaches on the day’s action. First year head coach Kyle Blackbourn has made upgrades to the Pioneers program. Delta played with a chip on their shoulder the whole day, playing stifling defense, getting on the floor for balls, and feeding off of each teammate’s individual performances leading to a 3-0 performance at the Jamboree. Delta is solid all around the court. 6’1″ freshman Markel Bradshaw comes from a winning high school program in Saginaw High, so it’s almost a given Bradshaw is going to play with passion and confidence any time he’s running point guard for Delta. 6’2″ off-guard Julian Henderson gives Delta a perimeter scorer with slashing potential, Justin Person can handle the ball a bit, but hit some threes off the bounce on the day. 6’7″ sophomore Chris Chrzan gives the Pioneers a stretch-four potential, 6’5″ Travon Cotton brings toughness as an undersized power forward, and 6’1″ Davian Phillips and 6’5″ Gabe Blalock gave Delta quality minutes off the bench. If Delta continues to improve in the pre-season, the Pioneers are interesting contenders in the MCCAA conference this season. West Bloomfield 6’7″ senior Zach Allread was perhaps one of the best forwards in Michigan who received the least amount of attention. Allread had only three scholarship offers before deciding on committing to the Timberwolves of Northwood University in Midland, Michigan. How does it feel to commit to Northwood? It’s an amazing feeling, feels like all of my hard work to get to this point has finally paid off. What was Northwood’s reaction when they heard you committed? They were happy and excited I chose Northwood. You committed shortly after visiting the campus, what was that experience like? The campus is in a perfect location that my family can come watch me play and they have a great atmosphere there, perfect fit. How do you see your play style fitting into Northwood’s system? How do they plan to use you? They have talked a lot about me coming in and playing a stretch 4 for them because I have the ability to shoot 3s but also can get to the basket. Are there any other commits in the class of 2015? If so, do you know any of them. If not do you know any players already on the roster? I don’t know if there are any other commits I don’t think there are. But I didn’t know any players but met a couple on the visit. What were some other schools looking at you and what was different about Northwood? And what are you expectations for this upcoming season, what role will you have on this team and how good can West Bloomfield be? Expectations are high, I will be a 3 or a stretch 4 primarily. The goal is to bring back some hardware and no reason we can’t do it. We have goo leadership and talent from Trishton Jackson and Michael King and have a trio of talented sophomores that will play a big role.